Top COPS Mia Leech and Jade Goode. City of Peterborough Swimming Club (COPS) members were in superb form at the recent East Region Championships. They had 27 swimmers competing in the event and between them they qualified for 70 finals and won seven gold, 11 silver and eight bronze medals. 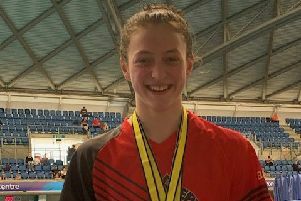 Top performer for COPS was Jade Goode, who finished as top swimmer in the girls 13 year-old age group and joint second in the overall championship table. She qualified for 11 finals and struck gold in the 100m fly and 200m individual medley events, silver in the 50m fly, 100m back, 100m and 400m freestyle and bronze in the 50m backstroke. Mia Leech (14) was placed joint second in her age group and joint fourth overall winning gold medals in the 200m and 400m individual medley, silver medals in the 200m breaststroke and fly events and bronze in the 100m breaststroke event. Amelia Monaghan (14) was placed sixth in her age group and joint 10th in the overall championship table by winning gold in the 100m and 200m breaststroke, silver in the 50m breaststroke and bronze in the 400m individual medley from her six appearances in finals. Henry Pearce (14) won COPS other gold medal in the 1500m freestyle and appeared in the 100m, 200m and 400m freestyle finals. Myles Robinson-Young (14): silver – 200m and 400m freestyle; bronze – 50m free. Other finals – 50m fly and backstroke, 100m free, 200m individual medley. Harriet Salisbury (12): bronze – 800m free. Other fiinals – 200m free, 400m free and individual medley. Anna Blakeley (14) finals - 50m back, fly and free, 100m free; Jack Brown (13) final - 100m breaststroke; Sophie Crowther (14) final - 400m individual medley; Sophie Griffin (12) finals – 100m and 200m breaststroke; Brenna Howell (12) finals – 50m, 100m and 200m backstroke, 200m individual medley; Ella McGhie (12) finals – 100m and 200m backstroke; Matthew Newson (13) finals – 200m fly, 400m freestyle and individual medley; James Rothwell (12) final – 400m individual medley; Matthew Rothwell (14) finals – 200m fly, 400m free and individual medley and Kenzie Whyatt (14) finals – 200m and 400m freestyle. Stella Blakely (12), Lauren Browne (13), Fabian Brudnicki (12), Hannah Daley (12), Holly Graves (12), Jessica Mahoney (11), Madeline Todd (11), George Whiteman (12) and Eve Wright. COPS head coach Ben Negus said: “I am pleased that we have maintained our high standards at these championships.